These men and women have the talent to be able to infiltrate websites and do serious damage. It is kind of funny that I cheer this group on but I do. In a different idea lets all do something at the exact same time all around the world. All time zones at the exact second that we declare we go to one website and we all fill out an inquiry form. We will shut the website down in seconds. Say 4.5 million click on the website at the exact minute. I set the date hour, minute and second and you tell your friends and everyone everywhere within your social circle and on and on. We determine the best time and set it. Dreaming what the power of the people really means. They will and are going to do the following. Knock the ISIS network off line. Messages will not be real and they will begin to second guess themselves. Maybe just maybe they will get the ISIS members to kill each other. I think they will be able to transfer the ISIS money to the people that need it. They have declared war on ISIS . Are you a serious technoid? cables went. Piss on it the techs will be here Friday. 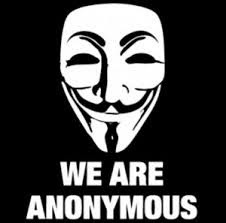 Anonymous and continue reading and listening in fact enjoy a glass of wine or a cocktail or a joint if it legal where you are. Then somewhat the same but their code is at the end Click below. Lastly A super technoid coder that is looking for a job changing the world?